As a mother of two teenagers, and a self-employed physiotherapist with her own practice, Susann is a truly skilled organizational talent, managing to strike a dynamic, consistently well-structured balance between family, home and work. The Easyprint design tool helps her with this – Susann designs the business and promotional documents for her practice online, but also likes to make personalised calendars for her loved ones in her spare time. 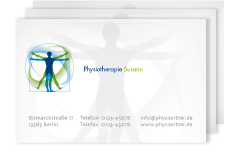 Susann prints her business cards at Easyprint. She also uses the back of them as appointment cards. For professional business cards, appointment cards or bonus cards. Alternatively also suitable as gift tags, vouchers or entry tickets. Easy to design, cheap to print.